Funny to think that smoking used to be allowed in pubs. I remember the scaremongering when the ban came in – the predictions that nobody would go out, that every pub would close and the world would fall apart. This, of course, didn’t quite happen. I remember the early days of the ban when we all realised that without the fags pubs are really horrible, smelly places. Now the better pubs aren’t so smelly, and the bad pubs can be sniffed out, quite literally, within moments. I guess the main downside of the smoking ban is the smokers now stationed outside. You thought you could avoid stinking of smoke after a night out? Think again, as you will be walking through a cloud on your way in and your way out. Even the dedicated smoking areas are right by the entrance, for fear of smokers wandering off into the night before they’ve emptied their wallets, I guess. The outdoor smokers are at their worst at Christmas. Walking from work to the station is now an obstacle course of avoiding lit-stick minor-fire-hazard wielding drunken hooray Henrys in the City, all far too gone for just after 5pm. It is freezing, yet the pavements are jammed with them, all working on their collective plumes. 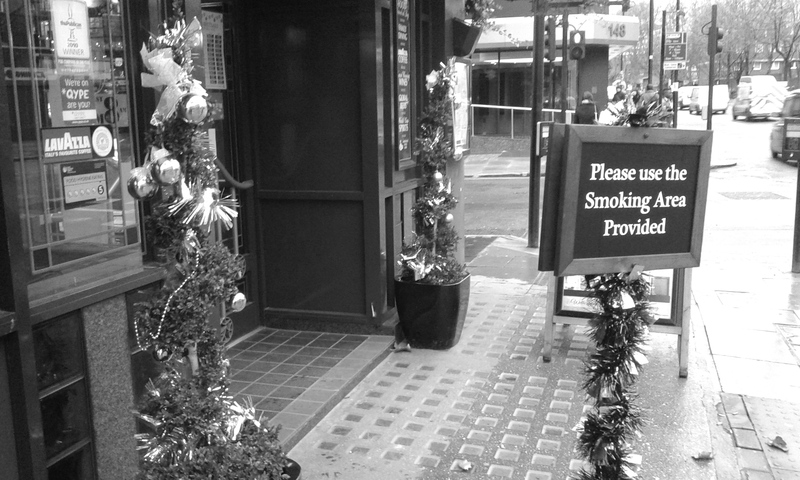 Their number is swollen as they are joined by the Social Smoker, who heads out for “just the one” as it is Christmas. They haven’t got any cigarettes themselves, but are more than happy to stalk around until they can get a free one from poor unsuspecting soul. Then another one. Then another. Then again, thinking about it, it is not just the smokers. December is a terrible time for a night out. Everywhere is full of amateur boozers, the over-eager and the like. But that is probably another tale for another time. We had a smoking ban in place here in Colorado even the last time I lived here, so it’s been going on at least seven years. It’s pleasant. Cigarettes smell like shortness of breath. But now that marijuana is becoming more commonplace here, I notice its smell much more than tobacco cigarettes. You can smell the shops from a block away. Yep, that is a pretty potent smell. That must be a little weird, having that going on and legally! I thought it was going to be crazier than it actually is. I guess I was expecting that the city would be living under one big hazy cloud but it seems like it’s much less pervasive.